Two-thousand eighteen has been quite an enlightening year for me as it has marked the dawn of my cider awakening. For the majority of my adult life, cider was the beverage on the shelf that sat nestled beside apple juice, and hard cider was the drink at the end of the store’s fridge past the cheap beer. It wasn’t until my work with CurEat introduced me to cider experts and makers like Mattie Beason, of Black Twig Cider House, Diane Flynt, of Foggy Ridge Cider, and Courtney Mailey, of Blue Bee Cider, that I acquired a taste for the ancient, fermented apple beverage. And thanks to a 45 minute conversation I recently had with Diane Flynt, I acquired countless bushels of respect for cider and its complexities, as well as inspiration from the woman who pioneered the revival of cider making in the modern South. The phone rang as I looked over the questions I had prepped in Google Docs for Diane, knowing very well that our conversation would naturally evolve into more than the black and white words on my computer screen. Diane was in the thick of planning a party that some called her retirement party, but what she called a celebration of the 21-ish years of hard work she and her husband, Chuck Flynt, put into Foggy Ridge Cider. Yet, she answered with a warm, inviting “hello”. I knew immediately that our chat would feel as though we were sitting on her porch looking out at her sprawling 250 acre farm in Dugspur, Virginia, a little town tucked away in the Blue Ridge Mountains. After briefly introducing myself and thanking Diane for taking the time to chat, I congratulated her on her retirement. To which she replied, “I don’t like to think of it as ‘retirement’. It’s more of a celebration and a transition into what’s next.” Diane’s transition out of cider production and making doesn’t mean she is leaving her apples behind forever. She and Chuck will still maintain and grow the five to seven apple varieties on their orchard, selling them to cideries. Diane will continue to educate chefs about cider and offer tree grafting classes. Needless to say, we can all take deep breaths because Diane and her heirloom apples aren’t going anywhere anytime soon. Being a four-time James Beard Award nominee and semifinalist, Diane is nationally known and respected for her work. But, I was curious as to how she found her way to the orchard, and why she chose to grow and graft her own apple trees on top of making cider. Her journey began in Georgia where she was surrounded by farmland. Diane’s grandfather was a farmer. As a young girl, she would spend time roaming the farm, eating apples from the trees that peppered the land. It was there that she would cultivate her love for agriculture. Diane would eventually leave the farms of Georgia to attend college, but her career path was far from working the land. “I always wanted to work in agriculture,” she said as she recounted the early days. “It was the 70s and the economy wasn’t great, and I wanted to be able to pay off my school loans. You couldn’t very well do that in agriculture.” She graduated with a business degree, and it was a big deal to be a woman pursuing a career in banking at the time. For more than 20 years, Diane wore many different hats in business and banking, which means she was in her mid-forties before she started Foggy Ridge Cider. “People thought I wanted to escape the corporate world, but I actually enjoyed it.” I could hear the sincerity in her voice. “I used a lot of the knowledge and experience I gained to operate Foggy Ridge Cider.” As someone who loves being part of a startup and equally loves the land like Diane, I was inspired by what she said next. “I see myself as a creative, and as creatives, we have the capability to do many different things. We evolve.” But, contrary to what many may think about sudden career changes, Diane’s transition from the corporate world to apple orchard didn’t happen overnight. Diane studied cider making for years before she and Chuck bought their 50 acre (now 250 acre) farm. “Many people think they can take a two week cider making course and be good to go. It’s just not the case,” she said. She even spent time in California and England, honing her cider skills that would be invaluable to the success of Foggy Ridge Cider. The decision to graft and grow her own cider apple trees, was quite intentional for Diane. Besides living in Virginia where apple trees thrive, making it a no-brainer to own an orchard, Diane loves growing trees. “I’m really good at growing wooded plants,” she said with humble confidence. “I wanted to grow something that would last forever.” Diane wanted to be the grower and the maker – which makes sense for someone who is a creative – and cider apple trees would allow her to be both. Thirty minutes into our conversation, there was still so much I wanted to know. My curiosity was thirsty. So in order to quench that thirst, I continued to ask questions. I wanted to know how she made cider, the length of time it took for the trees to grow in the Foggy Ridge orchard, the history of cider apples in North America (there was 17,000 varieties at one point), etc. You know, all the things I could have Googled, but I wanted to hear it from Diane, and she kindly answered all my questions without hesitation. Diane and Chuck planted their first cider trees in 1997, which was the beginning of Foggy Ridge Cider. They didn’t see the first fruits until 2000/2001. And in 2004, they were finally able to make their first batch of cider. I imagined giant oak barrels filled with fermenting apples, but that wasn’t the Foggy Ridge way. Diane chose to make cider in stainless steel barrels because she found that oak overwhelms cider’s already-complex flavors, and she wanted the flavors of the orchard to come through in every bottle. We talked about other things besides Foggy Ridge Cider like the 3000 sq. foot garden that she and Chuck cultivate together. “We have plum trees, cabbage, rhubarb, berries, etc. If I can grow it, it’s in the garden.” Even when they cook, they cook as a team, with Diane cooking the vegetables while Chuck prepares the meat. Although I could have talked with Diane for hours, I knew I needed to wind down our conversation. She wouldn’t let me go until I told her a little bit about myself, which I always have a hard time doing. And before we said goodbye, she invited me to her celebration party. I had no idea how inspired I would be after spending 45 minutes on the phone with Diane Flynt. She went from one male-dominated industry to being revered in yet another male-dominated industry, and she did so with a huge smile on her face and determination in her heart. Overtime, Diane allowed herself to grow and evolve and became like that heirloom apple that we all love and hope to find. For more information about Diane Flynt and Foggy Ridge Cider, visit the Foggy Ridge Cider website. You can also find Diane’s restaurant and bar recommendations by following her on the CurEat App. Because we’re all about having fun over here, CurEat founder Steve Mangano asked 10 of our CurEaters to share their BitMojis with us and Raleigh Magazine. We had a good laugh as the BitMojis started to roll in. They’re all pretty accurate. Can you guess which BitMoji belongs to the appropriate CurEater? CurEat founder Steve Mangano talks about his daily Raleigh coffee routine with Raleigh Magazine. Read more about what type of coffee he drinks throughout the day and where. You can follow Steve on CurEat for all of his Raleigh coffee shop recommendations. While my daily routine varies, I adhere to a strict coffee schedule, drinking a different style of espresso throughout the day. We are fortunate to have so many great places in Raleigh to help me stay true to my coffee routine and here, I’ll share just a few. CurEat Founder Steve Mangano Presents at Pecha Kucha + Choir! Choir! Choir! CurEat founder Steve Mangano spoke at Charleston Wine + Food’s Pecha Kucha + Choir! Choir! Choir! If you aren’t familiar with Pecha Kucha, its an event where speakers have 7 minutes to present their topic with 20 slides. Steve inspired the audience to seek and share positivity instead of leaving negative reviews that live on a review website for eternity. Watch his Pecha Kucha speech and be inspired to make a change in how you search for restaurants and bars! Hint: the CurEat App will help you make that change. While our work is international, we’re headquartered in Raleigh, North Carolina; with staff also in AR, TX, and AL. Our favorite moments are when we get to engage our local communities and form relationships with one another. We love when we are the common thread between people, or even groups of people – people who would otherwise not interact or develop friendships. The best way to do this is sitting down at the table, where everyone has a seat to enjoy good food and conversation, and where relationships are born. The power of sharing a meal is never lost on us, and we love the way food can bring us all together. In the rare times we are able to have our entire team together, it usually centers around food. Whether at some of our favorite Raleigh spots or in the homes of our friends and supporters, we cherish the time to join around the table and share life together. Seeing that the Help One Now team is comprised of individuals who have lived in different parts of the country, we know they all have good lists! We encourage you to open CurEat, find them and follow. We’ll even help you out! Help One Now is a non-profit organization that strives to end extreme poverty, care for orphans, rescue slaves, empower families, and see communities transformed through our international partners. CurEater Jason Alley, of Comfort, Flora, and Saison in Richmond, Virginia proves that restaurants are more than a delicious meal (though he has that covered, too). His first restaurant, Comfort, uses reinvented southern classics, putting Richmond on the map as a culinary destination. 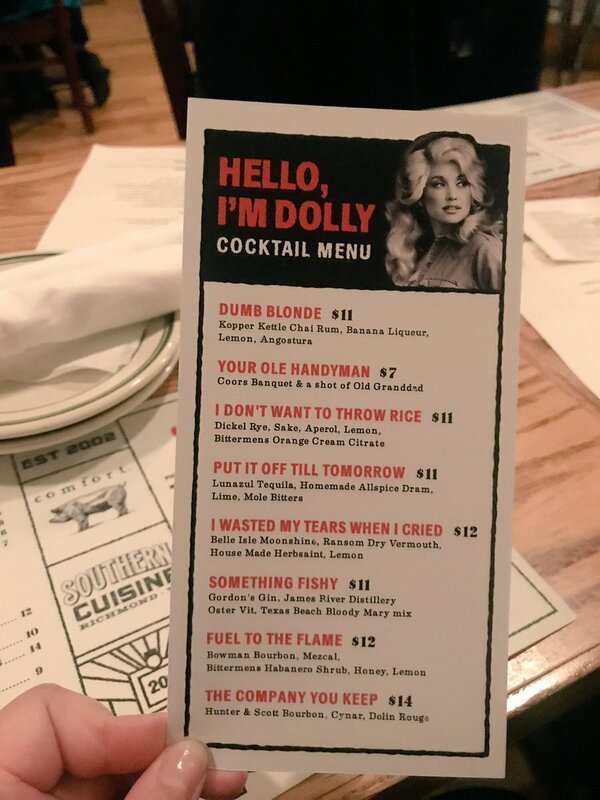 After years of serving acclaimed classics and drinks (like their Dolly Parton themed drink menu), Alley decided to give back. As of March of 2018, Alley and his team started donating all profits from Comfort to FeedMore a Virginia food security charity. After the success of Comfort, Alley opened Pasture, a southern small plate restaurant with an emphasis on local ingredients. Like Comfort, Pasture earned accolades and gained a loyal following. For his next venture, Flora, Alley looked a little further south. The Oaxacan-inspired cuisine from chef Sergio Gomez features classics like shark tacos alongside bar food, which comes in handy if you’re catching a show — Flora is also a music venue. Chef Alley will soon add to his empire with a gastropub-arcade called Bingo in Richmond’s Scott’s Addition neighborhood. For more from Jason Alley, follow him on Twitter, Facebook, and Instagram. Also worth reading: Jason’s moving essay about sobriety in an industry that can make it tough. To find out how Alley navigates Richmond’s burgeoning culinary wonderland, follow him on CurEat. Carrie Morey knows a thing or two about biscuits. After all, she is the founder of Callie’s Biscuits and Callie’s Hot Little Biscuit, and ships the South’s favorite bread all over the country. She also serves those biscuits at her Hot Little Biscuit grab-and-go stores in Atlanta and Charleston. Callie’s Biscuits have been highlighted by Oprah, Martha Stewart, The Today Show, and many, many more. The accolades are well earned. Carrie and her team mix each batch of Callie’s Biscuits by hand–no mixers. It’s a classic technique, one that Morey’s mother, Callie White, passed down. Callie’s Biscuits were first made famous through White’s celebrated Charleston catering business. Morey combined her passion for business with her inherited recipe and brought the biscuits to hungry fans from coast to coast–all while raising a family of her own. The success of Callie’s Biscuits has led to a tantalizing family of products. From classics like pimento cheese and ham biscuits to cinnamon biscuits and cocoa and cream cookies, Callie’s currently offers a wide variety of gourmet treats with a distinctly Southern accent. Follow Carrie Morey on Instagram, or find Callie’s Biscuits on Facebook or Twitter. For more of Morey’s Lowcountry expertise check out her cookbook. Finally to find out what restaurants butter her biscuits, check her out on CurEat. Also, because we love Callie’s, we are partnering with Carrie to give away a month’s worth of biscuits! Here’s how: Create a profile on the CurEat App and follow Carrie Morey. (She has great lists of where to eat and drink in Charleston and throughout the U.S.). Then comment “complete” on our biscuits post and you’re all set. Sean Lilly Wilson is the owner and the self-styled Chief Executive Optimist at Fullsteam Brewery in Durham, NC. Fullsteam, under Wilson’s direction, brews foraged beers with ingredients they source from North Carolina farms. Wilson got his start in beer, by changing laws. After starting the movement to raise the ABV limits in North Carolina, Wilson decided to create a distinctly Southern beer. Fullsteam, “A Beer From The Beautiful South” was born. Wilson’s beautiful beer has won plenty of awards. Wilson himself has been lauded, too, including three nominations by the James Beard Foundation for Outstanding Wine, Spirits, or Beer Professional. While others celebrate his work, Wilson makes to celebrate the work of others, including his support of North Carolina’s beer month. Fullsteam’s beers change with the seasons. When it’s hot, we like their Southern Basil. When the cold weather rolls through, we grab a First Frost. The brewery’s “plow to pint” philosophy means they have a strong connection to farmers and growers. The brewery also focuses on the community, cultivating close relationships with makers and artists. For more on Fullsteam check out their website or find them on Facebook. For more from Wilson, follow him on Instagram or Twitter. Finally if you want to see where he grabs a pint and a bite to eat, follow him on CurEat.